Product Name: Quinoa Seeds Buy Quinoa Online from The Spice Market, Quinoa is the one of most popular health food seeds in world. Whole Sale Price at Online Shop. We Ship All Over India. 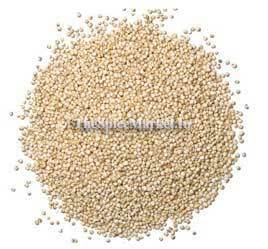 Quinoa is the common name for Chenopodium quinoa, a flowering plant in the amaranth family Amaranthaceae. It is a herbaceous annual plant grown as a grain crop primarily for its edible seeds. Because it is not a grass, it is a pseudocereal rather than a true cereal. Quinoa is closely related to the edible plants beetroot, spinach, and amaranth (Amaranthus spp. ), another pseudocereal which it closely resembles. Quinoa originated in the Andean region of Peru, Bolivia, Ecuador, Colombia and Chile. Traditionally, quinoa grain is harvested by hand, and only rarely by machine. Raw, uncooked quinoa is 13% water, 64% carbohydrates, 14% protein and 6% fat. Nutritional evaluations indicate that a 100 g (3.5 oz) serving of raw quinoa is a rich source (20% or higher of the Daily Value, DV) of protein, dietary fiber, several B vitamins and dietary minerals. Quinoa is gluten-free and considered easy to digest. Quinoa is also high in fiber, magnesium, B-vitamins, potassium, calcium, iron, phosphorus, vitamin E, and various beneficial antioxidants. Quinoa is High in Protein, Gluten-Free, Great Source of Fiber, Helps to Heart Health, Helps to Weight Loss, Helps Prevent Cancer, Reduces Diabetes Risk.